National Caster's Series 30 heavy duty casters feature a rugged construction with double ball bearing heat-treated raceways. A tough zinc plating protects the 1/4" cold forged top plate and yoke. The top plate and yoke assembly are joined by a 5/8" bolted kingpin. Wheel axles are 1/2" diameter bolt with lock nut. A 3/4" roller bearing allows the wheel to rotate freely. 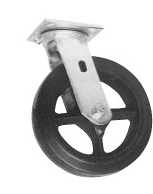 Hardened spanner bushing with grease groove, and grease fittings in swivel raceway and wheel provide easy maintenance for this medium heavy caster. A versatile caster with a bolt on top plate (welding possible) able to handle a variety of applications. Material handling chores, such as platform trucks, warehouse carts, stock picking trucks, and freight terminal usages are easily handled by the Series 30 casters. This caster also ideal on food service carts, and hotel and housekeeping carts. Overall, an excellent choice for machinery dollies, and industrial and commercial equipment. 3-1/4" 1-1/2 Semi Steel 400 4-1/4 NCC-30S3415-SSR 4.5 NCC-30R3415-SSR 4 "
Phenolic 600 NCC-30S3415-PHR 4.5 NCC-30R3415-PHR 4 "
3-1/4" 2 Semi Steel 700 4-1/4 NCC-30S3420-SSR 6.5 NCC-30R3420-SSR 6.2 "
Phenolic 700 NCC-30S3420-PHR 4.75 NCC-30R3420-PHR 4.45 "
Rubber on Polyolefin 250 NCC-30S415-TPRR 3.74 NCC-30R415-TPRR 2.31 "
Polyurethane on Polyolefin 500 NCC-30S415-PPUR 3.74 NCC-30R415-PPUR 2.31 "
Polyurethane on Steel 600 NCC-30S415-PUR 5.72 NCC-30R415-PUR 4.29 "
Polyurethane on Aluminum 700 NCC-30S415-PAR 3.8 NCC-30R415-PAR 2.5 "
4" 1-1/2 EZ Rolling Polyurethane on Steel 600 5-5/8 NCC-30S415-EZPUR 5 NCC-30R415-EZPUR 4.5 "
Semi Steel 600 NCC-30S415-SSR 5.28 NCC-30R415-SSR 3.85 "
V Groove 800 NCC-30S415-VGR 5.5 NCC-30R415-VGR 4.07 "
Polyolefin 400 NCC-30S415-POR 4.5 NCC-30R415-POR 3.5 "
Phenolic 600 NCC-30S415-PHR 4.7 NCC-30R415-PHR 3.27 "
Rubber on Steel 400 NCC-30S420-RSR 6.16 NCC-30R420-RSR 1.73 "
Rubber on Aluminum 400 NCC-30S420-RAR 5.06 NCC-30R420-RAR 3.63 "
Rubber on Polyolefin 300 NCC-30S420-TPRR 3.96 NCC-30R420-TPRR 2.53 "
Polyurethane on Polyolefin 700 NCC-30S420-PPUR 3.96 NCC-30R420-PPUR 2.53 "
Polyurethane on Steel 700 NCC-30S420-PUR 6.16 NCC-30R420-PUR 4.73 "
Solid Polyurethane 700 NCC-30S420-SPUR 3.96 NCC-30R420-SPUR 2.53 "
Polyurethane on Aluminum 700 NCC-30S420-PAR 5.06 NCC-30R420-PAR 3.63 "
4" 2 Cushion Polyurethane on Polyolefin 700 5-5/8 NCC-30S420-SCR 3.96 NCC-30R420-SCR 2.53 "
EZ Rolling Polyurethane on Steel 700 NCC-30S420-EZPUR 6.75 NCC-30R420-EZPUR 5.27 "
Semi Steel 1000 NCC-30S420-SSR 5.72 NCC-30R420-SSR 4.29 "
Heavy Duty Steel 900 NCC-30S420-SS-HDR 6.72 NCC-30R420-SS-HDR 5.29 "
Ductile Steel 1250 NCC-30S420-DSR NCC-30R420-DSR "
EZ Rolling Polyurethane on Steel 1200 NCC-30S420-CDSR 7.25 NCC-30R420-CDSR 5.9 "
V Groove 800 NCC-30S420-VGR 6.71 NCC-30R420-VGR 5.28 "
Polyolefin 500 NCC-30S420-POR 5.06 NCC-30R420-POR 3.63 "
Phenolic 800 NCC-30S420-PHR 5.25 NCC-30R420-PHR 3.82 "
High Temp Phenolic 800 NCC-30S420-PHR-HT 5.25 NCC-30R420-PHR-HT 3.82 "
Rubber on Polyolefin 300 NCC-30S515-TPRR 4.29 NCC-30R515-TPRR 2.86 "
Polyurethane on Polyolefin 600 NCC-30S515-PPUR 4.29 NCC-30R515-PPUR 2.86 "
Polyurethane on Steel 800 NCC-30S515-PUR 6.16 NCC-30R515-PUR 4.73 "
5" 1-1/2 Polyurethane on Aluminum 800 6-1/2 NCC-30S515-PAR 4.5 NCC-30R515-PAR 2.5 "
EZ Rolling Polyurethane on Steel 800 NCC-30S515-EZPUR 6.75 NCC-30R515-EZPUR 6.65 "
Semi Steel 600 NCC-30S515-SSR 7.48 NCC-30R515-SSR 6.05 "
Polyolefin 450 NCC-30S515-POR 4.29 NCC-30R515-POR 2.86 "
Phenolic 600 NCC-30S515-PHR 5.75 NCC-30R515-PHR 4.32 "
Rubber on Aluminum 500 NCC-30S520-RAR 5.75 NCC-30R520-RAR 4.32 "
Rubber on Polyolefin 325 NCC-30S520-TPRR 4.62 NCC-30R520-TPRR 3.19 "
Polyurethane on Polyolefin 750 NCC-30S520-PPUR 4.62 NCC-30R520-PPUR 3.19 "
Polyurethane on Steel 1000 NCC-30S520-PUR 6.6 NCC-30R520-PUR 5.17 "
Solid Polyurethane 1000 NCC-30S520-SPUR 4.62 NCC-30R520-SPUR 3.19 "
Polyurethane on Aluminum 1000 NCC-30S520-PAR 5.28 NCC-30R520-PAR 3.85 "
Cushion Polyurethane on Polyolefin 750 NCC-30S520-SCR 4.62 NCC-30R520-SCR 3.19 "
5" 2 EZ Rolling Polyurethane on Steel 1200 6-1/2 NCC-30S520-EZPUR 7 NCC-30R520-EZPUR 5.6 "
Semi Steel 1000 NCC-30S520-SSR 7.92 NCC-30R520-SSR 6.49 "
Heavy Duty Steel 1200 NCC-30S520-SSR-HD 9 NCC-30R520-SSR-HD 7.5 "
Ductile Steel 1200 NCC-30S520-DSR NCC-30R520-DSR "
EZ Rolling Polyurethane on Steel 1200 NCC-30S520-CDSR 9 NCC-30R520-CDSR 7.5 "
V Groove 1100 NCC-30S520-VGR 8.58 NCC-30R520-VGR 7.15 "
Polyolefin 650 NCC-30S520-POR 4.62 NCC-30R520-POR 3.19 "
Phenolic 1000 NCC-30S520-PHR 5.75 NCC-30R520-PHR 4.32 "
High Temp Phenolic 1000 NCC-30S520-PHR-HT 5.75 NCC-30R520-PHR-HT 4.32 "
Rubber on Polyolefin 400 NCC-30S615-TPRR 5 NCC-30R615-TPRR 4 "
Polyurethane on Polyolefin 500 NCC-30S615-PPUR 5 NCC-30R615-PPUR 4 "
6" 1-1/2 Polyurethane on Steel 800 7-1/2 NCC-30S615-PUR 8.25 NCC-30R615-PUR 7.25 "
Polyurethane on Aluminum 900 NCC-30S615-PAR 5.5 NCC-30R615-PAR 4.5 "
Semi Steel 700 NCC-30S615-SSR 7.75 NCC-30R615-SSR 6.75 "
EZ Rolling Polyurethane on Steel 800 NCC-30S615-EZPUR 9 NCC-30R615-EZPUR 8 "
Phenolic 800 NCC-30S615-PHR 5.14 NCC-30R615-PHR 4.14 "
Rubber on Steel 450 NCC-30S620-RSR 7.7 NCC-30R620-RSR 6.27 "
Rubber on Aluminum 550 NCC-30S620-RAR 6.5 NCC-30R620-RAR 5.07 "
Rubber on Polyolefin 450 NCC-30S620-TPRR 5.06 NCC-30R620-TPRR 3.63 "
Polyurethane on Polyolefin 900 NCC-30S620-PPUR 5.06 NCC-30R620-PPUR 3.63 "
Polyurethane on Steel 1200 NCC-30S620-PUR 8.58 NCC-30R620-PUR 7.15 "
Solid Polyurethane 1200 NCC-30S620-SPUR 5.06 NCC-30R620-SPUR 3.63 "
Polyurethane on Aluminum 1200 NCC-30S620-PAR 6 NCC-30R620-PAR 4.07 "
6" 2 Cushion Polyurethane on Polyolefin 900 7-1/2 NCC-30S620-SCR 5.06 NCC-30R620-SCR 4.06 "
EZ Rolling Polyurethane on Steel 1200 NCC-30S620-EZPUR 9 NCC-30R620-EZPUR 8 "
Semi Steel 1250 NCC-30S620-SSR 8.85 NCC-30R620-SSR 7.15 "
Heavy Duty Steel 1200 NCC-30S620-SSR-HD 9.6 NCC-30R620-SSR-HD 8.6 "
Ductile Steel 1250 NCC-30S620-DSR 9.6 NCC-30R620-DSR 8.6 "
EZ Rolling Ductile Steel 1200 NCC-30S620-CDSR 9.6 NCC-30R620-CDSR 8.6 "
V Groove 1200 NCC-30S620-VGR 10.12 NCC-30R620-VGR 8.69 "
Polyolefin 700 NCC-30S620-POR 5.06 NCC-30R620-POR 3.63 "
Phenolic 1200 NCC-30S620-PHR 7.5 NCC-30R620-PHR 6.07 "
High Temp Phenolic 1200 NCC-30S620-PHR-HT 7.5 NCC-30R620-PHR-HT 6.5 "
Rubber on Steel 500 NCC-30S820-RSR 9.68 NCC-30R820-RSR 8.25 "
Rubber on Aluminum 600 NCC-30S820-RAR 7.5 NCC-30R820-RAR 9.04 "
Rubber on Polyolefin 500 NCC-30S820-TPRR 5.5 NCC-30R820-TPRR 4.07 "
Polyurethane on Polyolefin 950 NCC-30S820-PPUR 5.5 NCC-30R820-PPUR 4.07 "
Polyurethane on Steel 1250 NCC-30S820-PUR 12.1 NCC-30R820-PUR 10.67 "
Solid Polyurethane 1200 NCC-30S820-SPUR 5.5 NCC-30R820-SPUR 4.07 "
Polyurethane on Aluminum 1250 NCC-30S820-PAR 5.5 NCC-30R820-PAR 4.07 "
8" 2 Cushion Polyurethane on Polyolefin 900 9-1/2 NCC-30S820-SCR 5.5 NCC-30R820-SCR 4.5 "
EZ Rolling Polyurethane on Steel 1200 NCC-30S820-EZPUR 13.1 NCC-30R820-EZPUR 12.1 "
Semi Steel 1250 NCC-30S820-SSR 12.1 NCC-30R820-SSR 10.67 "
Heavy Duty Steel 1200 NCC-30S820-SSR-HD 13.1 NCC-30R820-SSR-HD 12.1 "
Ductile Steel 1200 NCC-30S820-DSR 13.1 NCC-30R820-DSR 12.1 "
EZ Rolling Ductile Steel 1200 NCC-30S820-CDSR 13.1 NCC-30R820-CDSR 12.1 "
V Groove 1200 NCC-30S820-VGR 14.74 NCC-30R820-VGR 13.31 "
Polyolefin 900 NCC-30S820-POR 5.5 NCC-30R820-POR 4.07 "
Phenolic 1250 NCC-30S820-PHR 7.75 NCC-30R820-PHR 6.32 "